Often hit mobile games land on the iOS platform first before being released for Android users to enjoy, and that is certainly the case for Earn to Die as it hits the Android platform in time for some zombie road kill. The popular iOS game has now been released for Android owners of smartphones and tablets to smash and shoot their way through wave after wave of zombies. 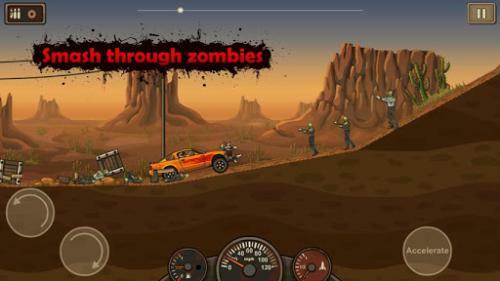 The game sees zombies taking over the cities so you have to equip your car or truck with a whole host of weapons to fight your way through the zombies. There are already millions of users enjoying the game around the world, and as you progress you will earn cash to upgrade and unlock new vehicles, or to customise the ones you already have. You can add guns, boosters, and even a spiked frame. The Android version features a brand new and extended story mode and there are eight different vehicles available, with each of them being customizable. There are realistic graphics with great animation, and you can even challenge your friends in the Championship Mode. There are two versions of the game on Google Play with a paid for version here, and a free version here. Are you a fan of the Earn to Die game?